MedCaT Supplies: Gels, Pastas, cremes, prep etc. For Ultrasound Gel, see here. Conductive Paste by Weaver. White, opaque, water-soluble adhesive paste designed to be used with EEG cup electrodes. Packs of 3 pcs. Developed and produced by Grass. EC2 combines the right conductivity, stickiness and liquidity for precision recordings. It is checked for its physical and chemical properties, from production to packaging. This insures you uniform properties and quality. The tube is designed to directly apply the crème to the desired location and can easily be removed with water and soap..
OneStep Cleargel is a conductive gel which improves test results. Due to a new composition compared to other conductive Gels OneStep Cleargel offers a unique texture for best conductivity. 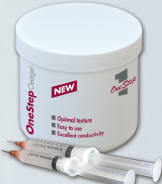 OneStep Cleargel is well suited for use with EEG caps, surface cup electrodes and ECG and EMG electrode applications. Electrode-gel and skin prep in one. Degreases, abrades the skin and makes a conductive contact. Skin friendly, odorless. Removable with water, or after drying, you can brush it out of the hair with a comb. Contains no grease or alcohol. Suitable for both routine-eeg, evoked potentials and long term monitoring. Viscous, does not run out. Highly conductive cream, by Parker Laboratories, 5 Oz bottle (150 grams). conductive gel, 260 gram bottle. WARNING: Special shipping charges may apply for Collodion. We will contact you about this. The syringes and blunt needles are used to inject conductive gel in the cup electrodes. Double sided adhesive rings for the fixation of Electrodes. Each rol has 500 rings.